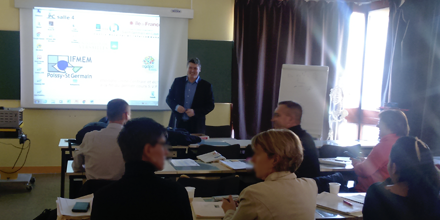 On Wednesday, 30 November, the Training Institute of Radiographers IFMEM,conducted a training session on how to optimize patient safety at Poissy/Saint-Germain-en-Laye hospital. As part of this session, Florent Jault, our Radiation Dose Monitor (RDM) product specialist, met with the students to share his professional experience on the topic. He not only presented the contribution of a DACS solution in medical imaging, but he also demonstrated the solution in real-time. Drawing on his radiographer education background, Florent addressed the issue of “how to manage the risks related to ionizing radiation, and how to improve professional practices”. Improving professional practices included the subject of using a DACS solution in a medical imaging department to better track the dose levels delivered to patients. “The alert system, based on the Diagnostic Reference Levels (DRLs), and the advanced statistical software tools are essential for monitoring patient dose,” Florent declared. After defining the DACS concept, Florent gave a live demonstration of RDM and presented some practical examples of how to use the DACS solution. “RDM is a solution with advanced statistical tools. An ergonomic solution, it makes comparing machines, adapting protocols, obtaining patient dose history, etc. quick and easy. These practical examples show that the solution helps reduce the dose delivered to the patient significantly,” Florent concluded.